When I served as a chaperone for a group of UC Irvine students on a three-week tour of India in 2010, our in-country guide clearly had no intention of letting us step foot on an Indian train. Though trains running between Delhi and Agra, where the Taj Mahal is located, cover the journey in only two to three hours, he insisted that we make the trip by private bus instead, arguing that we would be more comfortable in our own space. Despite my objections, we went by bus—a harrowing journey that, due to rain and under-construction roadways, took more than five hours in each direction. Even as I attempted to veto the bus ride, however, I understood the guide’s reluctance to send us on a train. None of us had been to India before, and for many students, it was their first trip out of the United States (in a couple of cases, out of California). Indian trains have a reputation for being chaotic, crowded, and dirty, and the guide clearly worried that the experience of riding one would prove overwhelming for some members of our group. Could this sound like a gimmick tailor-made for a book deal? Sure. But in Rajesh’s deft hands, Around India in 80 Trains is no Eat, Pray, Love, though she does spend one day in an ashram and another ten days in silent meditation. And she certainly enjoys eating—“omelette sandwiches” appear so many times that I eventually googled them (they sound delicious!). There’s also a potential love interest, her handsome Norwegian traveling companion/bodyguard, a friend of a friend whom she nicknames Passepartout in homage to Phileas Fogg’s manservant in Jules Verne’s Around the World in 80 Days. If this were a movie—or EPL—Rajesh and Passepartout would end the trip in each other’s arms; while they do follow the romantic comedy convention of fighting and separating in the middle of their journey, when they reconcile it is merely as friends. But while Elizabeth Gilbert and Eat, Pray, Love made me roll my eyes so much I’m lucky I didn’t damage my vision, Rajesh’s story left me wishing her trip, and the book, had been longer. She spends plenty of time searching her soul and examining her life (particularly at the end, which was a bit touchy-feely for my taste), but the true focus of the book is her encounter with India. Over the course of 80 train trips, totaling nearly 40,000 kilometers, Rajesh explores the extremes of life in India today, from the first-class Indian Maharaja-Deccan Odyssey to the “locals” in Mumbai, renowned for their “super-dense crush loads” of passengers. As a woman and foreigner, Rajesh attracts attention from nearly all of her fellow travelers—a colorful cast of characters who enable her to pepper the pages with humorous, but kind-hearted, comments and observations. Everyone she meets has questions: about her family, about her unmarried status at the age of 28, about her life in England, about her ambitious railway journey. Rajesh takes their inquiries in stride, accepting (with an ease that I might find difficult) that privacy disappears the moment one enters an Indian Railways carriage. In turn, these conversations help Rajesh understand the complexities of India today, and to see that she has been clinging to a negative image of the country colored by her childhood miseries nearly two decades before. Perhaps my favorite character, and one for whom Rajesh also seems to have a soft spot, is one who never actually steps foot on a train. Anusha, a ticket agent in the Delhi railway office, is vocal with her exasperation every time Rajesh and Passepartout present themselves in front of her desk seeking another stack of tickets. But while Anusha might profess annoyance at the pair’s complicated itinerary, she appears to enjoy the challenge of helping them execute their plans. Far from the expected caricature of an indifferent IndRail bureaucrat, Anusha seems protective of Rajesh and gets caught up in the 80-train challenge, even if she feigns otherwise. Rajesh has a flair for description (“Passepartout surfaced [from sleep] with the confused look of a hamster coming out of hibernation” is hands-down my favorite line in the book—I know that feeling), and her verbal portraits of the scenery are vivid and memorable. Her journeys around the subcontinent were clearly often exhausting, frustrating, and uncomfortable, but her enthusiasm in their retelling makes the whole endeavor sound appealing. I doubt I’d be up for 80 trains around India, but she’s definitely kindled my interest in riding at least a handful. If the book feels somewhat vague and unfinished toward the end, that makes sense: Rajesh wisely refrains from making any grand predictions about where India is going or what it will look like a decade down the road. It is, like China, a massive, complicated country facing a tangle of challenges—poverty, illiteracy, social and religious clashes, corruption, and many more—that hinder the government’s ability to achieve the lofty goals it has for the citizenry. How, and if, the state can address those problems is anyone’s guess. Despite the many obstacles it must deal with, the Indian government has built on the rail network the British left behind and sustained this vital component of the country’s infrastructure, serving 20 million passengers every day. As Rajesh demonstrates, hopping on a train (or 80 of them) might be one of the best ways to get to know India from the ground up. Maybe the trains don’t always run on time—but doesn’t that just add to the experience? Been a train lover since I had my first journey back in 2007. 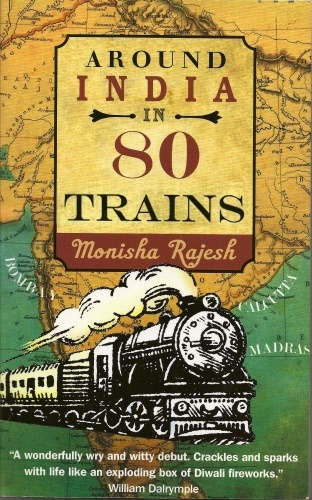 In this book the author gives a detailed yet beautiful account of 80 train trips she did in India ranging from the super luxurious Palace On Wheels to 3rd class passenger trains. On this journey she covered almost all states of India. Her writing style is simple and catching and the courage she shows all along the journey is tremendous.